The sampling guidelines for the Executive Opinion Survey aim to reflect in the composition of surveyed companies the economic structure of the country while maintaining a 50 percent share of respondents from previous years. Figure 1 summarizes respondent demographics from the 2015 edition, demonstrating the relative success of the Partner Institutes in following the sampling guidelines. Because small- and medium-sized enterprises (SMEs) account for a large share of economic activity in most countries, Partner Institutes are asked to collect the opinions from SMEs as well as from large companies (Figure 1a). In 2015, small enterprises, defined here as those with fewer than 50 employees, account for 27 percent of the sample in Advanced Economies and Emerging and Developing Asia and for 47 percent in Sub-Saharan Africa, reflecting the respective economic structure of these regions. In order to maintain a panel of constant respondents and improve the comparability of data across years, almost 4 questionnaires out of 10 have been filled by executives who have previously taken part in the Survey (Figure 1b). 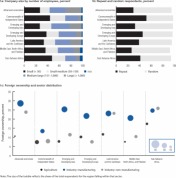 The Survey also aims to capture the diversity of companies in terms of ownership and economic sector (Figure 1c). On average, 18 percent of the surveyed companies’ equity is owned by foreigners (as either minority or majority shareholders). This number increases to 22 percent and 21 percent in Sub-Saharan Africa and Advanced Economies, respectively. The share of foreign ownership also varies according to the economic sector. 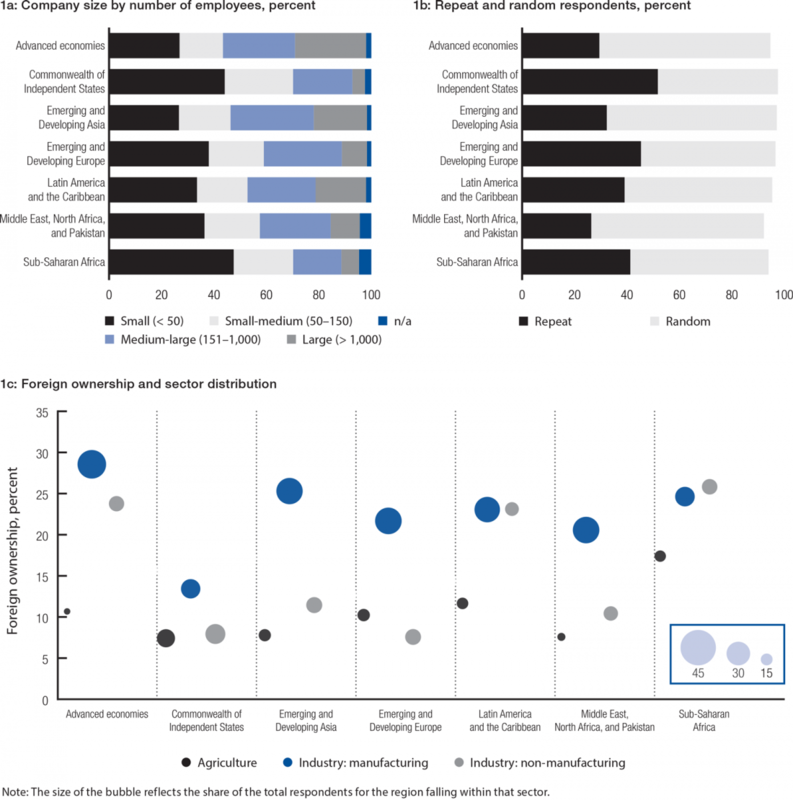 The manufacturing sector is the one with highest presence of foreign-owned companies in most regions, except for Sub-Saharan Africa and Latin America and the Caribbean, where it is preceded by other industrial activities (including mining), and the Commonwealth of Independent States, where the service sector comes in first. The agriculture sector is the one with lowest share of foreign ownership—around 10 percent across regions—with a peak of 17 percent in Sub-Saharan Africa and a minimum of 7.5 percent in the Commonwealth of Independent States and Middle East, North Africa, and Pakistan.